Tributes are being paid to Dr Nancy Grace Roman, the first woman to hold an executive position at the US space agency Nasa. Dr Roman was known as "Mother of the Hubble" for her work on the early stages of the Hubble Space Telescope. Nasa said her most important legacy was the advancement of women in the sciences and the generations of young scientists she inspired. She died in Maryland on Wednesday at the age of 93. Dr Roman was fascinated by the clear night skies of her childhood home in Nevada from a very early age. She joined an astronomy club when she was just 11 and her passion for stargazing continued throughout her life. But the young Dr Roman had to fight prejudice to be allowed to study maths and science at school and university. "I still remember asking my high school guidance teacher for permission to take a second year of algebra instead of a fifth year of Latin," she once told the Voice of America. "She looked down her nose at me and sneered, 'What lady would take mathematics instead of Latin?' That was the sort of reception that I got most of the way". Despite the obstacles, she obtained a doctorate in astronomy from the University of Chicago in 1949. A position in the United States Naval Research Laboratory followed. 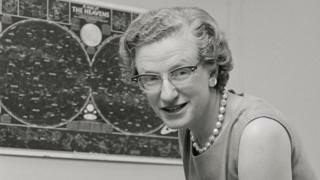 She was later recruited by Nasa to be its first chief of astronomy in 1959, where she would work for two decades. In a video released by Nasa in February, Dr Roman said she never had problems with her male Nasa colleagues. "I was accepted very readily as a scientist in my job," she said. "The men were very co-operative, and I felt that the men treated me as one of the team without a problem." Her best-known contribution to the sciences is the planning of the Hubble Space Telescope, famous for its stunning images of the stars she had loved so much as a child. Launched in 1990, it has been described as one of the most important scientific instruments ever created. Throughout her career, Dr Roman was a passionate advocate of women in the sciences, teaching astronomy to elementary school children in the 1990s. Her work has been recognised by a Women in Aerospace Lifetime Achievement Award and Nasa's Exceptional Scientific Achievement Award. In 2017, when Lego created a 231-piece Women of Nasa set, a figurine of Dr. Roman was included among four women identified as space pioneers.